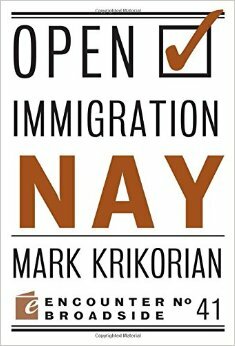 Order a copy of Open Immigration: Yea & Nay at Amazon.com. Immigration has always been an important part of America’s story. Over the past century, however, the United States has seen drastic changes – in government spending, the economy, technology, security, and assimilation – and the needs of the nation have changed. Mass immigration is no longer compatible with those needs. In this Broadside, Mark Krikorian argues that the federal immigration program needs to adjust to the realities of modern America by scaling back the number of newcomers who are allowed to settle in the country. While this doesn’t mean zero immigration, it does mean that we must evaluate and permit only the most compelling cases. What worked in the past will not work today, and our immigration policies must change in response to new circumstances. Extensive immigration restrictions are an attempt by the U.S. government to centrally manage the demographics, labor market, and culture of the United States instead of letting those facets of our society develop naturally – as they have throughout most of history. Many objections have been raised against a return to America’s traditional free-immigration policy, but they are without merit and ignore immigration’s tremendous benefits. In this Broadside, Alex Nowrasteh explains how a policy of open immigration is consistent with America’s founding principles, the ideals of a free society, and the foundation of a free-market economy. Immigration restrictions should be based on protecting the life, liberty, and private property of Americans from those who are most likely to infringe upon them. A freer immigration system would not only be economically beneficial to the United States, but it would also be consistent with American values.